The synthetic chemical element Meitnerium, atomic number 109, was first synthesized at the Gesellschaft für Schwerionenforschung in Darmstadt, Germany. It was 38F in Cleveland Ohio, the lowest temperature ever recorded for August in that state. Steve Miller's Abracadabra hit #1. A new Chevy Malibu cost about $8000. And, on August 29th in 1982, Ingrid Bergman died. at about 3:00 that afternoon. We had an elegant small wedding with a delicious dinner and beautiful music and have never looked back. And I'd spend my life with no one else. I love you. Awww - Love K's comment. Hurrah for you. 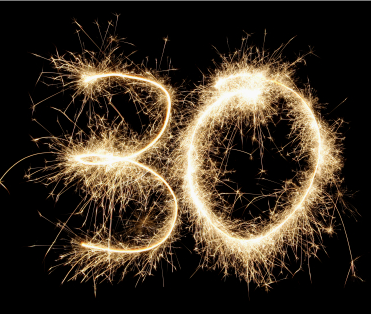 Thirty is a momentous occasion. Congratulations! K's comment made me all teary. Happy Anniversary! Life is good when you would marry the same person all over again. I'm all misty-eyed now. Happy Anniversary! Congratulations on 30 wonderful years together! Here's to the next 30 and beyond; you're an inspiration to those of us still hoping to find a love of that depth, commitment and complexity. Cheers! Congratulations you sweet birdies! 30 is awesome, I am hear to tell you! We will be 32 this year and it just gets better. We danced to It Had To Be You. And it guess it did have to be since we barely dated anyone else. Congratulations! 30 years is a long time to be happy but I wish you both another 30 years of the same. Well that is really rather lovely. A belated Happy 30 years and two days !